My church experience is primarily nonconformist, by which I mean that we weren’t big on liturgy or creed, pilgrimage or fasting. I have, however, always been intrigued by the ancient practices of the church and the spiritual disciplines that lie behind them. 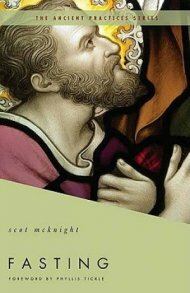 It was with this in mind that I started reading Scot McKnight’s book Fasting which is part of a series of books called The Ancient Practices. Fasting is the body talking what the spirit yearns, what the soul longs for, and what the mind knows to be true. In one sense Jon does give a process for fasting, but his process of A > B > C that is used throughout the book refers to a sacred moment > fasting > results. Even then Jon tries to be very careful with not drawing a causal link between B and C.
Fasting is the natural, inevitable response of a person to a grievous sacred moment in life. The elements of this definition should now be clear. Fasting is the choice not to eat or drink for a specified period. Fasting is not the same as abstinence, which is the choice not to eat or drink specific items even though one is still eating and drinking other items. Neither is fasting the same as dieting, which is the choice not to eat or drink various items for health reasons. Fasting, as we see it in the biblical tradition, emerges from an organic and unified sense of the whole person – body and spirit (or soul) acting in consort. For the unified person, fasting is both natural and inevitable when that person encounters sacred moments in life. There is also a lot of good sound advice on the practice of fasting, it’s not all theory, but understanding the context for biblical fasting is very helpful. Like many people I suspect, I’ve regarded fasting, a bit like prayer, as something I should do more of without any real understanding of why. This book gives a really good description of why and in what context. The book concludes with some practical advice about some of the physical effects of fasting and the dangers which, again, is very informative. I don’t think I’d really thought about the medical dangers before. There are some book which I pick up and read through without really stopping to think too much. This book is one to take a little slower and to ponder along the journey. I suspect it will also be a book that I go back to from time to time to ponder some more. I can’t say that this book has revolutionised my approach to fasting either, but it has put me in a place where I now what I would like to do and now just need to get on and do it. I read all sorts of books, but the books that keep drawing me back are books of characters. In a Cast of Characters Max Lucado takes a set of characters from the Bible and tells their story. These aren’t just a retelling of the well known stories but a new look at the familiar. Sometimes he tells the story by changing the time and the place, at other times he tells a parallel story, other’s are a look at the story from another perspective. The characters come from both the old and new testaments. Some of them a major biblical characters, others appear just once. All of them are characters. I particularly liked the story of Jairus, who sought out Jesus for the healing of his dying daughter. This story is recast into the current as the story of Wallace a preacher and influential man. A whole new look at an encounter between Jesus and a man in need. Rather than storming through this book I’ve used it as a focus for my times of quiet contemplating the questions at the end of each chapter. The questions are really well constructed, asking you to consider rather than asking for a simple a-b-c answer. A great read. Thought provoking. Spirit lifting. I wasn’t sure how I was going to get on with this book, I’m not a Guinness drinker and wondered whether that lack of connection would hinder the reading, but it didn’t. I really enjoyed it. This book is subtitled “A Biography of the Beer that Changed the World” which is true, but this book is also a biography of a family, the biography of a company and to a certain extent the biography of a country. I used to do some work for Diageo who now own the Guinness brand so was interested to understand the history of the company. Like many of the great brands it turns out that Guinness was born out of the vision of one man and maintained through a number of generations, each of them holding true to an overall philosophy. Speaking as a product of my age, who only knows beer as a highly commercialised product, I was surprised by the ancient history of beer which is covered as an introduction to the book. I particularly liked the idea that St. Patrick won over many an Irish tribal chief with his tasty beer. Arthur Guinness the founder of Guinness sounds like a fascinating person – forward looking and practical. Reading about Arthur I’m drawn to a man of action and of principle. Many companies talk about Corporate Responsibility, it’s a current trend, and Guinness stands as a historic example that few come close to. It’s fascinating to read, though, about a family that continues on through the generations with the same set of high principles inspired by Arthur. It seems that there are only two career choices for Guinness’s – brewing or the clergy. Their influences read like a who’s who of western Christianity – Wesley, Whitfield, Barnardo, Hudson Taylor, Spurgeon, Moody, Booth, Shaftsbury. My favourite of the family has to be Rupert Guinness who, having received £5 million as wedding gift decided that he’s going to move into a slum and to use the money to improve the community where he was living. The book also goes on to talk about the more modern company that is Guinness and in particular their use of advertising. Imagine releasing tens of thousands of bottles of Guinness into the seas as an advertising gimmick these days – but that’s exactly what they did in 1954 and 1959, and these bottles are still being found. I enjoy biography most of the time, and this book was no exception. It’s a great mix of history, biography and story. It’s also immensely challenging to see what one family can achieve. 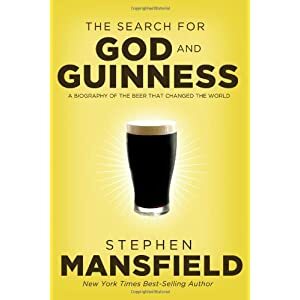 Amazon: The Search for God and Guinness. Some times you need someone to say something or do something that gives you a different perspective on things. I have been struggling with these posts a little because, to be honest, I haven’t had anything to say. Nothing has stood out as something that was worth writing about. I blog as part of my spiritual disciplines. If I stop walking closely with God I very quickly run out of things to say. And so I blog to ensure that I continue to read the Bible, I continue to seek after God and continue to read good books. If I become lax in these activities my blog suffers. It really is a thermometer that measures my spiritual temperature. If that sounds selfish, so be it! Now that’s a different perspective. The issue isn’t the blog, the issue is the rest of my life. So I contemplated what it was that might not quite be right and the answer was quite plain when I thought from this new perspective. I’ve been reading this book as my ‘spiritual’ book and to be honest it’s a bit too nice, perhaps safe is a better word but I think you know what I mean. For my other reading I’ve been reading Grumpy Old Men and to be honest I’m most of the way through and I’ve reached the point where there isn’t actually anything new; there’s only so much of someone else’s grumping that you can take. This evening Sue and I (with Jonathan tagging along too) went out for a drink to the local book shop and I bought myself a new book. I don’t think this will be as nice, safe or grumpy as my current books; hopefully it will be a lot more inspiring. Interestingly Adrian seems to be suffering from a bit of bloggers block to. The other day I stood under three trees and looked up at them and the blue sky beyond. 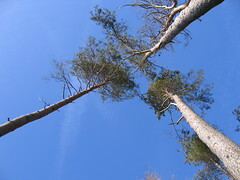 These were tall slender trees going straight up. I wondered what it would be like to be sat at the top of one of those trees. As we walked further on we saw a buzzard sat at the top of one of these tall slender trees observing everything that was happening around searching for some prey; a completely different perspective. Sometimes different perspectives are exactly what you need. How do you find your different perspective? How do you know it’s a good perspective? So if you’re serious about living this new resurrection life with Christ, act like it. Pursue the things over which Christ presides. Don’t shuffle along, eyes to the ground, absorbed with the things right in front of you. Look up, and be alert to what is going on around Christ–that’s where the action is. See things from his perspective. Your old life is dead. Your new life, which is your real life–even though invisible to spectators–is with Christ in God. He is your life.